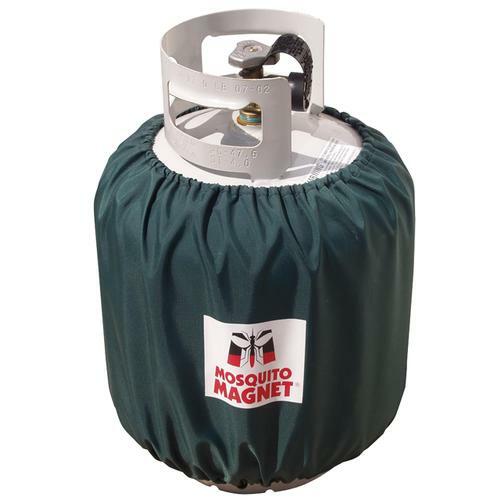 This Mosquito Magnet Tank Cover (MMTNKCVR) is designed for use with all Mosquito Magnet models, and it fits any standard 20 lb. propane tank. The tank cover is useful in a couple of ways. First of all, having a propane tank out in the elements as it does its work combating local biting insects means that it will be exposed to all sorts of weather. A tank cover can help protect the tank from moisture, rust, and debris accumulating on the exterior, which can eventually lead to some level of decay. The cover also provides a measure of camouflage. This not only helps your Mosquito Magnet and the attached propane tank blend into a natural setting to make it less visually obtrusive, it can also help break up some of the potentially bright-colored and shiny surfaces that may put off some insects. Mosquito Magnets certainly work perfectly well and are extremely effective whether you have a tank cover or not, but adding a cover to the setup is simply a good idea and may save you some money by not having to replace the tank down the road. Had the Mosquito Mag for years and just purchased the tank cover. Great quality and hides tank nicely.